Ok one last photo from L.A. After posting yesterdays photo I went out one last time to get some food and luckily I was at least carrying my small camera because the streets were just crazy. Hollywood really just starts once it gets dark. There are artists and performers everywhere. Well my Sony might not be as good as my main camera but it still handles situations like this quite well. It definitely allows me to get closer to people than I could with my big camera for shots like this. So if anyone is looking for a compact travel-camera the Sony RX-100 series is a great recommendation from me and should I ever do such a long trip again I will definitely looking to get a smaller main camera. Anyways now I spend a day on airport and in planes to get to Costa Rica where the adventures start anew. Another day in Hollywood comes to an end and with that my time in Los Angeles. Wow I really did not do much here. But well I have already seen all the important sights of the city in former travels and wasn't all that impressed back than and this city is really hard to explore without your own transport. The public transport system is just the worst and it takes you forever to get anywhere. So no beach and no Beverly Hills for my this time. Nevertheless I did do something new today which I really wanted to do here: I walked up to the Hollywood Sign. It's a nice walk up the hill and away from all the noise of the city. I had to organize some things this morning so I left for the sign relatively late and till I returned it was already late afternoon, so there wasn't much else to do. A really short and more of a relaxing time here I have to say....doesn't really compare to what I did in Beijing in almost the same time. Tomorrow is a day of travelling and then I will be in Costa Rica. It's gonna be fantastic! After a long day waiting around at airports and a lost night (remember: over-night flights going east will steal you a night) I have finally arrived in Los Angeles. I'm only going to stay here for two days before moving on to Costa Rica. I have been to L.A. before and never really liked the city, there are just too many people and too little to do. Oh well but since basically every flight from Hawaii via a stopover in L.A. is, did I thought I might just stay there for a bit. This saves me from spending over two days just at airports and gives me time to organize some things before going south. I really won't be doing much while I'm here so I guess the pictures won't be that great either. Just wait till I'm in Costa Rica and till then read yesterdays post on Hawaii. When planning this whole trip I knew I wanted to visit an island in the pacific on my way from New Zealand to America. There are a lot of islands to choose from but I decided on Hawaii. I just thought they had a bit more to offer than just palmtrees on white beaches. I know that doesn’t sound to bad but as I wanted to spend about two weeks there I knew I would be bored really quickly. So I booked flights to and from Honolulu and just waited what happened. After a trip through time I arrived in Honolulu late Wednesday evening after leaving Auckland Thursday morning. Yay I won an extra day of travelling. Honolulu was actually quite a shock, after my time in New Zealand I wasn’t anymore used to such big cities and that many skyscrapers. Well but it is the capital of Hawaii and Waikiki is of course so full with tourists they need that many hotels. I decided right there that I’m not going to spend two weeks just on that one island. Nevertheless my first destination in Honolulu were of course the beaches of Waikiki. They are nice but overrun by tourists and well quite frankly I have seen many beaches on my worldtrip which are a lot prettier. But if it’s just a 5 min walk from the Hostel you’ll end up spending a lot of time there anyways….and the sunsets are incredible. I went out there almost every evening for some photos. But as you might have figured out by now my style of travel never really involves relaxing. So on my second day I was already of to see Pearl Harbor. Anyone whose ever been to school or seen the Micheal Bay movie should know what this is all about. Great thing is you can just take a public bus for 2,50$ to get there, it might take two hours from Waikiki but it’s way cheaper than going on a tour-bus. Once there you can visit the museum for free as well as the Arizona Memorial. The memorial is on top of the battleship Arizona which was sunk during the battle and lays on the bottom of the harbor to this day. And that basically concludes my educational experiences on Hawaii. Most of the other days were spent exploring the rather boring downtown of Honolulu and waiting for the sunset. Oh and of course some small hikes. The first was to the top of Diamond Head. The famous crater just outside of Waikiki. It’s a short rather undemanding hike to the top, only the sun can get a bit intense but the views from the top are as expected really great. This viewpoint lets you see all of Honolulu. The other hike was to the Manoa Falls. Quick tip here: If it hasn’t rained in a while don’t bother going there, they will barely exist. Actually don’t walk there at all, spend the 2,50$ on the bus instead of walking through town for 2 hours before even reaching the trailhead. I didn’t rent a car on Oahu so to see some the rest of the island I had to join a tour and as I also wanted to take good pictures I joined Oahu Photography Tours. They offer great tours to the most interesting photospots on the island at a reasonable prices. Most importantly for me, they start of at sunrise. That gave me the opportunity to get the shoot I was hoping to get on this island. Another highlight of the tour is the Northshore. That’s the place where the gigantic waves are braking. An actionfilled surfshot was exactly what I was after. I might not need the instructions they give you on the tour but they did take me to places I would have never been able to find on my own and that totally made it worth it. And with that my days on Oahu were almost over. There was just one last picture I had to get: A Hula Girl. I know it’s a cliche but isn’t that what most travel-photography is about? Anyways there is a free Hula show every other night at Waikiki beach just after sunset. Guess who sat in the first row with a gigantic camera on his last evening? The show was really nice and surprisingly long considering it’s for free. The girls were pretty and my seat perfect so I left Oahu with all the pictures I wanted. In my mind the highlight of Hawaii isn’t Oahu and definitely not Honolulu, it’s the Big Island and that’s were I went next. You can only travel in between the islands by plane and as it is america this makes island hopping a bit more expensive. Otherwise I would have probably visited even more. The Big Island started of great with dozens of sea turtles right at the beach just hours after I arrived. I was actually just thinking to spend a relaxing evening at the beach but then a saw a turtles head looking out of the water. I was stoked, grabbed my tele lens at ran to the shoreline hoping to see it pop up again. Well it didn’t show up in the water again as it was right next to me a minute later. In fact there were dozens of turtles coming to shore all along the beach. An amazing experience and a good indication of how awesome my time on Big Island was going to be. The next day I decided it was time for some stars and as you might know the Big Island is actually the best place in the world for stargazing, that’s why all the big observatories are there. And by there I mean Mauna Kea in particular. The highest mountain on Hawaii at about 4200m, tallest mountain in the world, darkest place in the world and of course guarantied clear skies every night. Getting up there was actually quite an adventure on it’s own. This is america so of course you can reach the summit by car but I was only driving an incredibly crappy rental. My car was already struggling just on the way to the visitorcenter which is about halfway. The rest of the road to the summit is actually a steep gravel-road. There was no way my car was going to make that. I was really disappointed as I really wanted to go up there and see those observatories. Luckily I met a really nice Canadian couple with an SUV that gave me a lift to the top. That was perfect as the top of the mountain is really something you do not want to miss. You feel like you are on another planet, you are on top of the clouds, red volcanic stones everywhere, no plants just white futuristic domes everywhere. Absolutely breathtaking (not just because of the height) and a photographers dream, I took so many photos up there. Afterwards I got back down to the visitorcenter to watch the sunset over the clouds and then ultimately watch the stars. The moon was a bit bright but you could still see an incredible amount of stars. This is one of the most do things if you are on Hawaii. The Big Island is of course the island of volcanoes so after the stars that’s what I had to see next. So I went to the Volcanoes National Park. A huge park and you can definitely spend more than one day there exploring all the hikes and visiting all the craters. It’s just such a surreal landscape with the old lava flows everywhere forming and reforming it all the time. Also it’s just cool walking on solid lava. All the big flows have been in the 70s and 80s and unfortunately there is no lava flowing at the moment. I really wished I could have seen that, it would have made for some awesome photos. But it wasn’t all just cold black rocks, the highlight is the Halema'uma'u crater. Said to be the home of the god Pele this gigantic crater is still the most active on the island. You can’t see the lave as it is to deep and you are to far away but once the sun sets the glow of the lave turns the smoke orange. An incredible sight especially when the stars are starting to show up at the same time. If you are on the island, you have to wait there till after sunset. So there are the two highlights of the island but it has of course so much more to offer. There are for example volcanic black sand beaches, a completely strange sight but cool photo spot, and of course an extremely rugged and beautiful coastline all along. My personal highlight of the coast was in the north and is called Pololu Valley and seems to be directly out of a movie. You have to drive a tiny and narrow road through the rainforest to get there but that just makes it so much better. Less accessible means less people. The valley itself is in between rugged cliffs covered in waterfalls and end into the ocean via another black sand beach. Inside the valley is an untouched forest where you just expect dinosaurs behind every corner. A great off the beaten path location especially since the other end of the valley, Waipio Valley is currently closed due to a Dengue outbreak. The only thing Hawaii is not good in is cities, Kona as well as Hilo are really rather boring and pretty empty, you can skip those without regrets and just focus on the incredible nature. Oh by the way, did I tell you there are also great waterfalls all over the island? The most impressive one is Akaka Falls just outside of Hilo. Well that concludes my time on Hawaii. 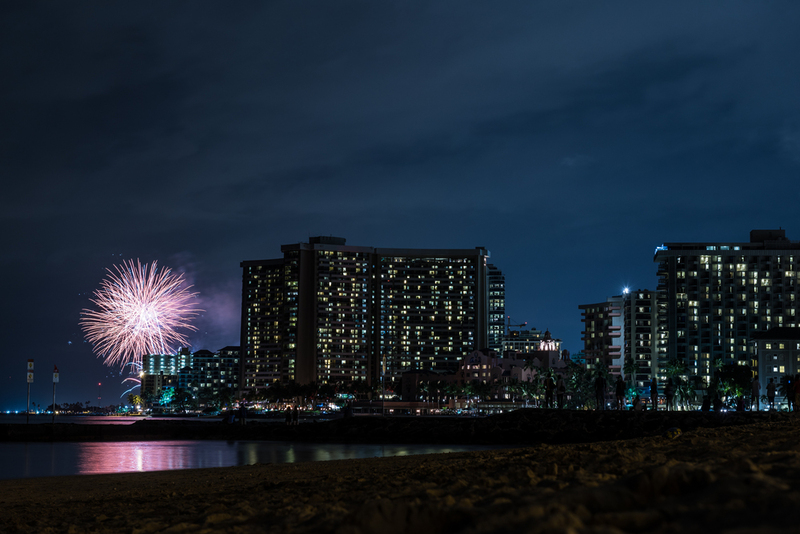 It was an incredible time and although I did not really like Honolulu, the Big Island is a place I would love to visit again at some point. By the way I did manage to drive over 2100km in my rental in just one week, not to bad considering I was on an island. Now I’m waiting for my flight to Los Angeles where I will stop for just two days before it is time for my next big adventure in Costa Rica. I can’t wait to get there. Anyways here are some more photos from Hawaii, as always clicking on any of the photos will enlarge them. Well the sun isn't shinning every day on Hawaii, in fact I didn't saw it at all today. Nevertheless I can't spend a whole day just doing nothing, especially if you can't even go to the beach. That's why I went to see the last thing I so far hadn't seen on the Island: Waterfalls. Only problem was they are all on the other side of the island, so it was once again a lot of driving involved. First I visited Rainbows Falls which are nice but the real highlight were the Akaka Falls. The highest falls on the island and completely surrounded by jungle. If only it wasn't raining all the time. Top tip here: park your car outside the gates to the official carpark and you only pay 1$ instead of 5$ to see the falls. This was my last day here, tomorrow I'll be flying back to Honolulu and from there to Los Angeles. It's going to be a long day of just traveling but watch out for my complete Hawaii posting tomorrow as well. Welcome to Jurassic Park! While exploring the westcoast and far north of the Big Island I found this unbelievable place. Pololu Valley is really a place like straight out of a movie. You have those high tree-covered cliffs surrounding a black sand beach. And don't forget the waterfalls pouring into the sea in the distance. On top of it all it's still really deserted, especially down in the valley you can walk around the forest without seeing anyone, I was really expecting a dinosaur coming around the corner any second. This was truly one of the coolest places I found on the island. I mean the volcanoes are incredible and Mauna Kea simply breathtaking but this almost empty and primal piece of nature is just something you don't find often. The Big Island has once again outdone itself. Now I have only one day left before I have to move on again. I'll be very sad to leave but new adventures await. It's been another day of driving and I mean a lot of driving. It's not just seems like a lot of driving because you have to go so slow most of the time, no I have already driven over 900 miles since I picked up the car on Thursday. Well they call it Big Island for a reason. First stop today was Hilo, the second bigger town on the Island opposite of Kona. Everyone recommends going there but to be honest it was rather boring, the downtown is tiny and pretty much empty. There are a few old buildings from about a 100 years ago. Unfortunately most of them are in a pretty bad condition, Hawaiian cities really seem to have a problem with poverty. To get there I took the highway straight through the island over the mountain, which was quite a challenge for my car but at least there was no traffic, on the way back I decided to take the coastal road. I still had a lot of time, so I could visit Volcano NP again and also stop at this spot. I actually saw this old pier on my first trip to the volcanoes and knew it would make for a great photo at the right time. And today was that right time. I set up my camera (or better balanced it in the wind on a narrow ledge leading to the pier) and got the shot surprisingly quick, I only got a little bit trenched in sea water, those waves were massive. It was one of those situations where I was happy for the extra weight of a weather proofed camera and glad I spent the extra money on the carbon fiber tripod. My gear, my clothes, my body, everything gets pretty roughed up on this journey. No Stars today...the weather is to bad and I'm to lazy and don't feel like driving in the dark for hours. But I have been active today, I went and hiked the Cook-Trail. A short trail that starts close to my hostel and takes you down to the ocean to the exact place Captain Cook was killed. I know that because there is a monument to his honor. This place is also popular with snorkelers, although most of them arrive by boat instead of hiking. Afterwards it was time for some driving today, there were a few spots I saw along the way yesterday and wanted to take a closer look at. One was Southpoint which unfortunately was closed due to a bush-fire. The other is what you see here: Black Sand Beach. Another reminder of the islands volcanic origin and unsurprisingly a popular tourist spot. I didn't get exactly the photo I had in mind because of all the people but I guess this one is still acceptable and shows the black sand in a more interesting way. 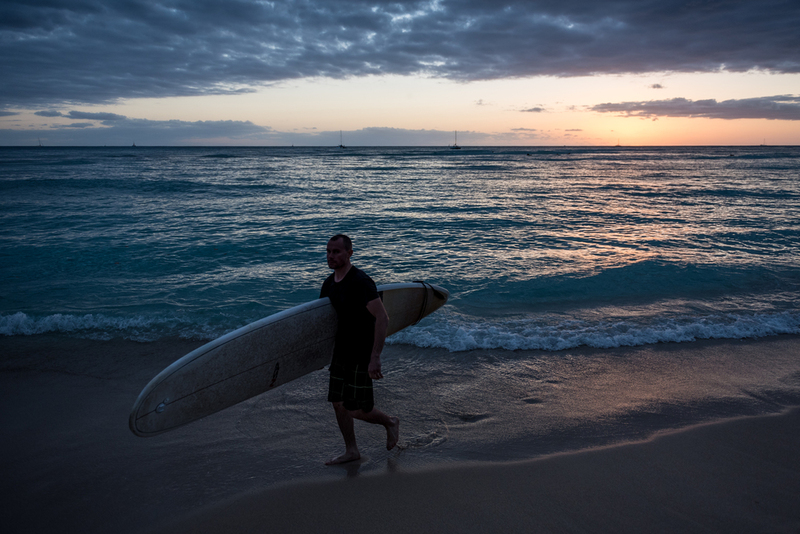 Why did I waste so much time in Honolulu? I should have come here way earlier, Big Island is just a dream come true for every photographer. Where else do you have jungles, volcanoes and the ocean in such close proximity? I especially love those night-skies, even outside of Mauna Kea it's so dark everywhere and the sky so clear. Anyways today I explored the Hawaii Volcanoes National Park, which as you can guess by the name all about volcanoes. There are dozens of craters in all shapes and sizes and basically everything in covered in volcanic rocks, the result of hardened lava from old and recent eruptions. Unfortunately (well at least for photographers) there is not much activity at the moment and the little bits of flowing lava there is can't be visited on any normal ways. But even those desolated landscapes alone are worth it. 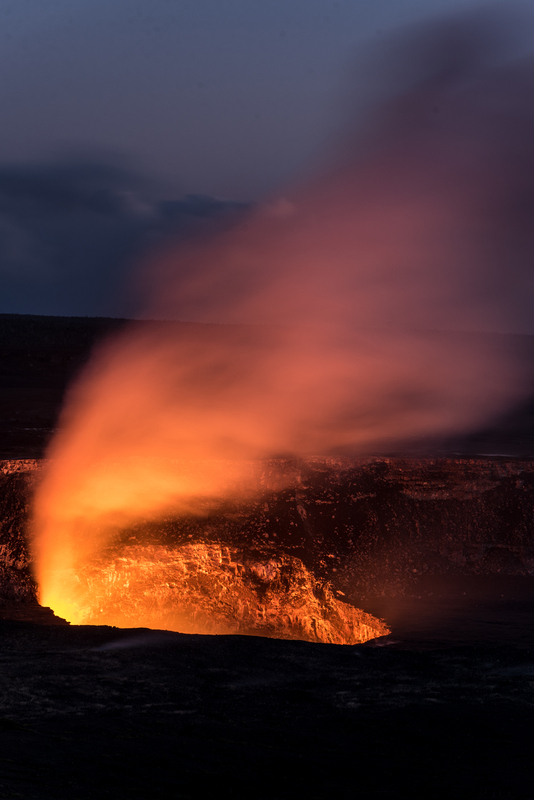 The highlight of the trip was of course Halema'uma'u, the most active volcano of the park. You can only the see smoke from the viewpoints as the magma is to far inside the crater but once the sun sets the spectacle begins. The orange glow of the magma starts illuminating the smoke...orange glowing smoke with the stars shining over the whole sight. The photo can't really do it justice, I have once again found the most spectacular sight of the journey. This view and the photos made even the 2,5 hour trip back to the hostel worth it all. Let's see what tomorrows adventure will be, I hope something that allows for an earlier sleep.